Learn about and support the Pretty Brown Girl Movement. The Pretty Brown Girl Movement is a campaign to celebrate and uplift young girls all around the world who have a brown skin tone. It started with T-shirts, tote bags, and buttons from a variety of vendors, but now the movement is getting more attention thanks to a visionary lady who was just concerned about her daughters. Many say that the ideal beauty standard in America has traditionally been blonde hair and white or light skin. Young girls with darker skin tones are left out of that narrative and sometimes develop low self-esteem growing up. The girls they see on mainstream magazines and television ads don't usually look anything like their image in the mirror. Sheri Crawley, co-founder of Pretty Brown Girl LLC, became concerned when she and her family moved to a mostly white suburb near Detroit. Her very young black daughters quickly started to reject black dolls and ask for hair care products to straighten their hair. In response, Crawley started to call her daughters "pretty brown girls." She expanded on this issue in an interview with BlackAmericaWeb.com: "It's simple, but a healing statement on so many levels. For so long, as a nation, everywhere across the world, it's the opposite message our girls are receiving. There is this natural bias as a society about what's preferred, that we as adults have, so it's passed onto our kids." February 25, 2012 was the first annual Pretty Brown Girl Day. Thousands of little girls and their parents gathered around the country in places like Chicago, Atlanta, and Detroit to support the movement. 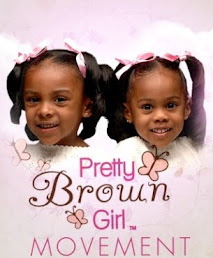 The Pretty Brown Girl company sells a number of products ranging from t-shirts and wristbands to brownie pops and books. All of them seek to uplift and redefine the ideal of beauty, at least in the eyes of young black girls. The Pretty Brown Girl Movement is a breath of fresh air for parents who have concerns like Crawley's. You can support the movement or learn more at the company website.